Public health professionals recently put out a notice recommending facilities to avoid products containing bleach for routine cleaning and disinfecting. Instead, they suggest using safer yet effective products with hydrogen peroxide as the active ingredient. Bleach can harm both children and adults, especially when strong concentrations are used. Bleach is known to trigger asthma attacks and cause new cases of asthma in those who use it frequently, like janitors and custodians, professional house cleaners, and maids. For some of these people, very small exposures can cause increasing symptoms after the first exposure. Another family of chemicals to avoid during routine cleaning and disinfection. 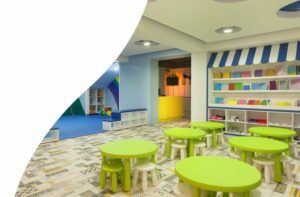 Here is the up to date Tips for Cleaning Child Care Facilities the Safe & Healthy Way Fact Sheet. 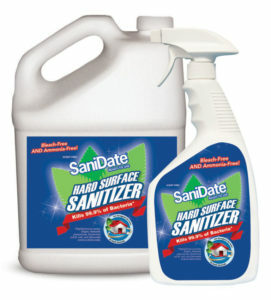 When looking for a sanitizer, SaniDate Hard Surface Sanitizer is the right choice. SaniDate Hard Surface Sanitizer – The Bleach Alternative! SaniDate Hard Surface Sanitizer is an EPA Registered sanitizer with the active ingredient being hydrogen peroxide. It is Ready to Use, so no daily mixing or discarding unused product. Also it is a 1-minute contact time and no rinse required as well. SaniDate Ready to Use Hard Surface Sanitizer is formulated with an activated peroxide chemistry that easily and safely cleans, sanitizes, deodorizes and kills 99.9% of bacteria. Safe for use on hard surfaces, including food contact surfaces, SaniDate Hard Surface Sanitizer is made without harsh chemicals or strong odors. Perfect product to be used snack tables, cutting boards, dishes, utensils, food prep areas, high chair tables, non-mouthed toys, and MORE!